This well known English surname is of early medieval origin, and is one of the patronymic forms of the medieval male given name ''Hodge'', a pet form of ''Roger''. The Normans introduced ''Roger'' into England after the Conquest of 1066 as ''Rog(i)er'', which was adopted from the Germanic ''Ro(d)ger'', composed of the elements ''hrod'', renown, and ''geri, gari'', spear. The equivalent Old Norse name ''Hrodthgeirr'' reinforced the form of the name in Normandy. The substitution of ''H'' for ''R'' as the initial in the English variants of ''Roger'' reflect the difficulty encountered by English people in pronouncing the Norman (French) ''r'' sound. Early examples of ''Hodge'' as a given name are recorded as ''Hogge'', as in the 1208 Fines Court Records of Lincolnshire, and the first recordings of the surname are similar (see below). The modern spellings first appears in the 16th Century, and the recorded forms include Hodge, Hodges, Hodgeson, Hodgson, Hodgett, Hodgetts, etc. Early recording examples include Ricardus Hoge in the 1379 Poll Tax rolls, Ebbota Hoggese in the same rolls, William Hodges listed in the Suffolk Subsidy Rolls of 1524, and Agnes Hodgett in the Marriage License lists of London for the year 1577. 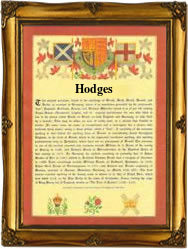 Where it occurs the final ''s'' as in ''Hodges'', is a reduced form of ''son of ''. The Coat of Arms originally granted in Gloucester in 1610 or thereabouts, has the blazon of a gold field, charged with three black crescents, and on a black canton, a gold coronet. The first recorded spelling of the family name is shown to be that of Alicia Hogges, which was dated 1327, in the Subsidy Rolls of Somerset, during the reign of King Edward 11, known as ''Edward of Caernafon'', 1307 - 1327. Surnames became necessary when governments introduced personal taxation. In England this was known as Poll Tax. Throughout the centuries, surnames in every country have continued to "develop" often leading to astonishing variants of the original spelling.